Health Partnership Clinic (HPC)) will hold a variety of activities to mark National Health Center Week (NHCW) 2018. The activities are part of a national campaign during the week of August 12-18 to raise awareness about the mission and accomplishments of America’s Health Centers and the dedicated staff who bring health care to the medically underserved. 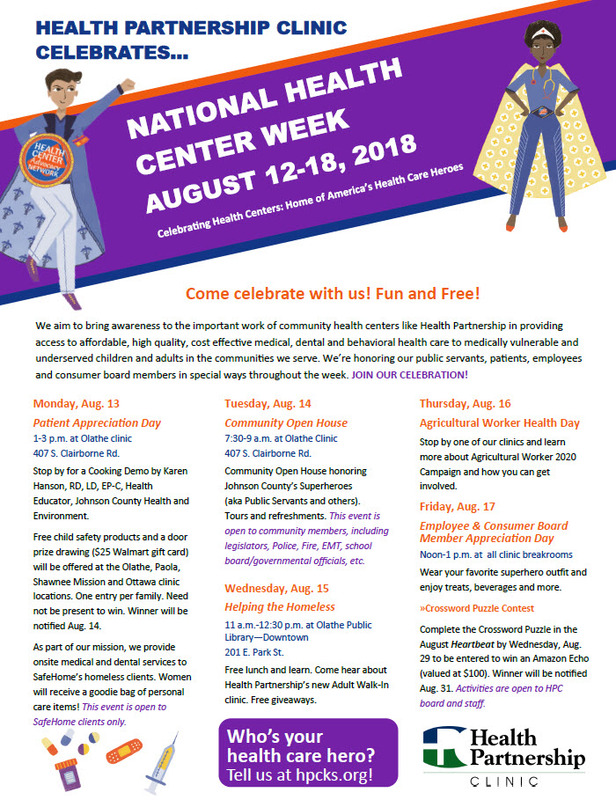 The heroes who work at health centers and help make affordable health care possible for people in need are at the center of this year’s NHCW. More than 205,000 people work at health centers in positions that include clinicians, nurses, social workers, dentists, dental hygienists, behavioral health specialists and many more. Working together, these health care heroes produce innovative solutions to the most pressing health care issues in their communities. They reach beyond the walls of conventional medicine to address the factors that may cause sickness, such as lack of nutrition, mental illness, homelessness and substance use disorders. It is their work that has helped reduce health care costs and reduce chronic disease, generating a record of success and along with it a long tradition of bipartisan support in Congress. Stop by for a Cooking Demo by Karen Hanson, RD, LD, EP-C, Health Educator, Johnson County Health and Environment. Free child safety products and a door prize drawing ($25 Walmart gift card) will be offered at the Olathe, Paola, Shawnee Mission and Ottawa clinic locations. One entry per family. Need not be present to win. Winner will be notified Aug. 14. As part of our mission, we provide onsite medical and dental services to SafeHome’s homeless clients. Women will receive a goodie bag of personal care items! This event is open to SafeHome clients only. Community Open House honoring Johnson County’s Superheroes (aka Public Servants and others). Tours and refreshments. This event is open to community members, including legislators, Police, Fire, EMT, school board/governmental officials, etc. Free lunch and learn. Come hear about Health Partnership’s new Adult Walk-In clinic. Free giveaways. Stop by one of our clinics and learn more about Agricultural Worker 2020 Campaign and how you can get involved. Wear your favorite superhero outfit and enjoy treats, beverages and more. Complete the Crossword Puzzle in the August Heartbeat by Wednesday, Aug. 29 to be entered to win an Amazon Echo (valued at $100). Winner will be notified Aug. 31. Activities are open to HPC board and staff.